* Field Name: Enter in a name for the User-Defined Field. * Active: If this box is checked, the User-Defined Field is active. * Description: Enter in a description for the User-Defined field. Data Type: Designate the type of data the User must input. E.g., a Date of Order field would need Date selected in this field. Categories: Designate the categories to which the User-Defined Field pertains. Colors: Allows you to select some colors for the User-Defined Field. 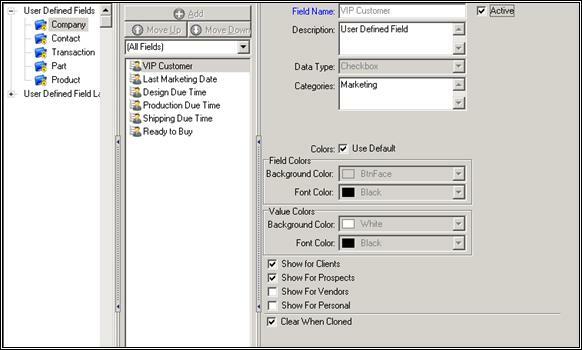 Background Color Field Value: Pick a background color for the field value. Font Color Field Value: Pick a font color for the field value. Background Color Value Color: Pick a background color for the value color. Font Color Value Color: Pick a font color for the value color. Default Formula: Enter the default value CFL formula for the UDF. Show for Clients: Check this box if you want the User-Defined Field to appear in clients' records. Show for Prospects: Check this box if you want the User-Defined Field to appear in prospects' records. Answer Required: Check this box if an answer is required for this User-Defined Field. Reset when Cloned: If this box is checked, when you clone a company record, whatever you entered into the original company's field for this User-Defined Field will be reset to the default value. Reset when Estimate Converted to Order: If this box is checked, when you convert an estimate to an order the UDF value will be reset to the default value. Entry Type: Denote whether you want an entry box or drop-down menu. Dropdown Values: Designate what you want your dropdown values to be. Limit to List: If this box is checked, the User will only be able to pick from this list, and will not be able to enter in anything else. Allow Multiple Selections: Check this box to allow multiple answers to the User-Defined Field. Move Up: Move a User Defined Field up one space. Add: Add a new User Defined Field. Move Down: Move a User Defined Field down one space. Clone: Copies a pre-existing order, estimate, or product to a new record. Delete: Removes an estimate or product from the database.